DESCRIPTION: IWS assisted the project team in evaluating various Value Engineering options to help bring the project within the allocated budget. In addition to extensive work on design and construction of systems including a) 25,000 gallon primary tank; b) a 60’ by 60’ recirculating sand filter; c) 10,000 ft2 constructed wetlands which included the planting of California Bulrush; d) 2, one acre percolation ponds; d) 5,000 gallon dosing tank; and e) telemetry based control system. Sysco Food Services of Sacramento (Pleasant Grove, CA) was in need of a wastewater system upgrade to meet their Central Valley Regional Water Quality Control Board (CVRWQCB) discharge limits. Brown and Caldwell (BC) had designed a constructed wetlands system for the site and obtained approval from the CVRWQCB to handle the 10,000 gpd of domestic wastewater from the food distribution center. IWS worked with Sysco and BC to provide value engineering so that IWS could construct the proposed system within the budget constraints of the project. The 310,000 ft2 Sysco Sacramento facility services commercial kitchens throughout Northern California (north to the Oregon border and east to Fallon, Nevada). With over 400 employees and a full service cafeteria to service the shift workers, the domestic wastewater treatment plant is a critical component of the day to day operations. 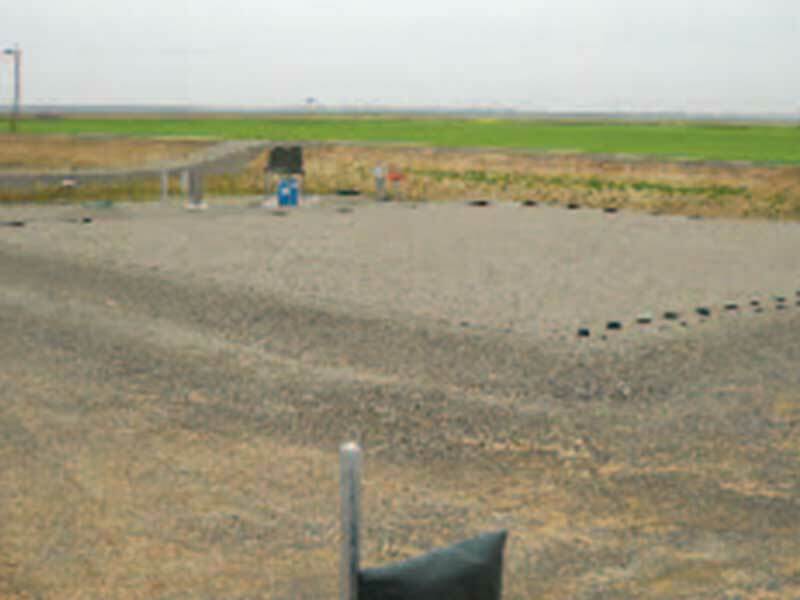 To meet the CVRWQCB requirements, the existing SBR was taken out of service and a new plant with the following configuration was constructed: a) 25,000 gallon primary tank; b) a 60’ by 60’ recirculating sand filter; c) 10,000 ft2 constructed wetlands which included the planting of California Bulrush; d) 2, one acre percolation ponds; d) 5,000 gallon dosing tank; and e) telemetry based control system. The tanks were provided by Jensen Precast of Orland, CA (www.jensenprecast.com). Additional site work was required as part of the IWS scope of work which included: a) constructing access roads; b) installing new collection piping; c) landscaping; d) underground street crossing of a pipeline; e) decommissioning of the existing plant, f) and related site activities. IWS assisted the project team in evaluating various Value Engineering options to help bring the project within the allocated budget. Specific Value Engineering components included: electrical and control systems; tank configuration; piping configuration;and other site improvements. One of the project challenges that IWS encountered was a very tight schedule due to regulatory delays (by others) and changes in the FEMA guidelines for the berm heights around the two percolation ponds and the storm water overflow pond. As the FEMA maps were revised prior to the start of permitting, IWS was required to change the excavation and fill requirements toadd s everal feet to the berm’s completion elevation. IWS completed this work, along with a constructability assessment with the Design Engineer, Brown and Caldwell, with minimal impact to the schedule and the overall footprint and cost of the earthwork portion of the project. The work was completed in accordance with new FEMA standards and County compliance requirements.